The much-maligned classic gets a black tie makeover! 2. Place six cups of water in a large pot and bring to a boil over high heat. Liberally salt the water and add the macaroni. Cook for approximately nine minutes or until al dente. Drain, reserving one cup of the pasta water and set aside. 3. Squeeze excess moisture from the artichoke hearts and place them in a food processor along with the tomatoes, onion and garlic. Pulse until the mixture is finely minced and evenly distributed. Set aside. 4. In a small saucepan melt butter over medium heat, add flour whisking constantly until it forms a paste. Add marsala and whisk until incorporated. Add the milk in increments whisking constantly until it forms a thin sauce. 5. Whisk in one cup of Parmesan and the artichoke mixture. Reduce and bring to a simmer until the cheese is completely melted. Add mustard and tuna and stir to combine. Season with salt and pepper to taste. 6. Remove sauce from heat and pour over macaroni, adding as much pasta water as you need to thin the sauce enough to coat the pasta. 7. Pour macaroni into a prepared nine-inch casserole dish, approximately three inches deep. Set aside. 8. In a small bowl combine breadcrumbs, the rest of the cheese and olive oil. 9. 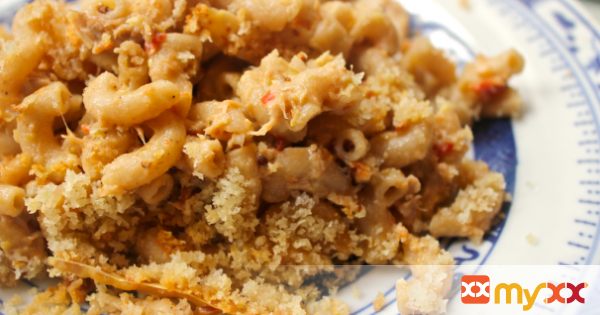 Cover macaroni with breadcrumb mixture and garnish with strips of Parmesan if desired. Bake for 20-25 minutes or until golden brown and bubbly.